First published in 1966. Professor Dryer has furnished a highly illuminating account of Kant’s Critique of Pure Reason by unfolding its central argument. 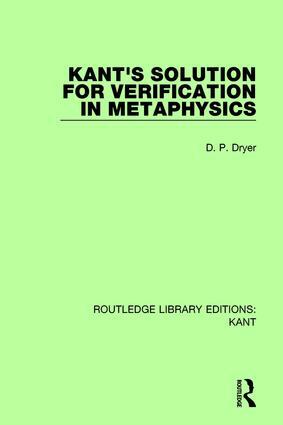 Kant’s Solution for Verification in Metaphysics brings out the light which Kant has to throw on central topics of philosophy. It takes its place as an indispensable guide to every student of the Critique of Pure Reason. This set reissues 6 books on the German philosopher Immanuel Kant originally published between 1938 and 1990. The volumes examine Kant’s most well-known essays, including the Critique of Pure Reason, and attempt to explain Kant’s arguments by expressing them in a more modern idiom. This set will be of particular interest to students of philosophy.